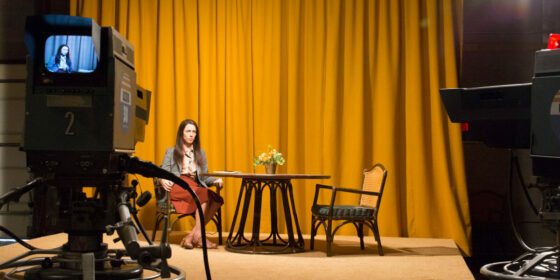 A perfect exemplar of a bad good movie, Antonio Campos’ Christine traps (an excellent) Rebecca Hall in a series of impeccably composed frames as the famously ill-fated Sarasota local news anchor Christine Chubbuck. One good way to gauge your patience for this exercise in high-handed dread is how you react to seeing a protagonist who you know for a fact is going to kill herself at some point before the movie’s end introduced in front of a massive container with “FRAGILE” emblazoned across the front. Imagine Elephant (2003) if the point of Gus Van Sant’s formal gamesmanship was to definitively “explain” Columbine rather than to gesture helplessly at the impossibility of understanding, and you’d have something pretty close to Campos’ dubious achievement here. The movie builds an airtight case: Christine is stifled at work and sexually frustrated; she refuses to go on medication for her depression and suffers terrible personal and professional embarrassments; she becomes fixated on guns and rejects all efforts to penetrate her orbit of paranoid loneliness. Christine presents its namesake’s suicide as the logical end to a mathematical equation, and inflates it into an epitaph for an era (and in case you missed the historical commentary, the script name-checks Woodward and Bernstein and Watergate and mentions the 1974 dateline a half-dozen times). As if that wasn’t enough, Campos even drags in the theme music to The Mary Tyler Moore Show to point up the gulf between sitcom idealism and real-life despair—perhaps the hollowest piece rhetorical point-scoring in recent memory.